What Do Jews REALLY Think About Jesus?! With Holy Week beginning today and Passover beginning tomorrow night, this is a time of year that brings up not only joy and festivity, but also some complexity with regard to Jewish-Christian relations. In the past, Easter was a deadly time to be Jewish. 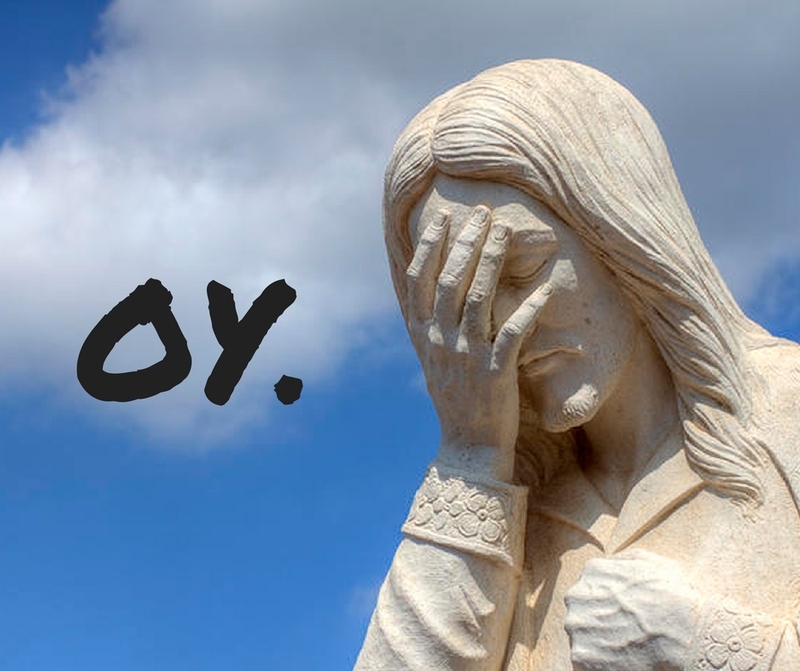 All the focus on Jesus’s death stirred up a lot of anti-Jewish sentiment, because until very recently, Christians believed we were responsible for his death. Many of the worst anti-Jewish riots occurred around Easter time. We stifle a sigh and try to figure out how to answer that question as tactfully as possible. Look–I get it. To most Christians, Jesus is God, except he’s the “personal connection” part that feels like your buddy and friend and father and confidante. For many of the people who ask me this question, their lives and the lives of their entire community revolve around Jesus. It’s very difficult for them to fathom how somebody could possibly live a deeply religious life with no Jesus. Well… here is my complete and honest answer. Truth Is–We Don’t Think Much About Him at All. Mohammed is not even in their frame of religious reference. He’s not a figure involved in their practice, prayers, or religious contemplation. That’s how it is for Jews vis-a-vis Jesus. He’s just not relevant to us. So there are a few things Christians believe about Jesus that Jews completely reject. The first is that he was the Messiah and a prophet. Both of these things are believed, to some extent, by Muslims as well as Christians. So give each other a high five. We Jews are gonna just… stay out of that party. The reason we don’t believe he was the Messiah is pretty straightforward: he didn’t fill a single one of our traditional criteria. Our readings of the messianic prophecies in Isaiah, Ezekiel, etc. are very different from the Christian interpretations. See here for the Jewish concept of the Messiah. If this was the only difference, however, Christianity would still be a messianic subgroup of Judaism, as it was at first. It was only when the theological stuff started to get weird (*cough*Paul*cough*) that Christianity split off and became its own religion. So the second thing we reject is the concept of the Trinity, and of Jesus being the son of God. This theological concept is totally beyond the pale of Jewish belief. We believe in one invisible, omniscient, omnipresent God. Not in one God who is divided into three “parts” and certainly not a God who ever manifested Himself in a human being. That’s just… no. The third thing Jews reject about the Christian idea of Jesus is this idea that he was the “sacrificial lamb” who died to atone for the Original Sin and all subsequent sins of humanity, replacing the need for animal sacrifices for atonement. First of all–we have a very different concept of what the Original Sin was and what it means for humanity. You can read more about that here. In short: we don’t believe anyone is born “tainted” with it and we don’t believe atonement for it is necessary. We believe people are judged by God according to the choices they make during their lives, not according to an ill-advised bite of fruit taken by an ancestor thousands of years ago. Second of all–we already have a way to atone for our sins. It’s called teshuva, and it is a deeply personal process that only the sinner can do for himself. You can read more teshuva about here. Third of all–atonement sacrifices were only one kind of animal sacrifice, and as far as we’re concerned, those are still “on.” Most of us (Orthodox Jews) believe that when the Temple is restored we’re going to go right ahead and do those again. Replacing them with a dude who was actually God and sacrificed himself was definitely never on the agenda. So If He Was Just a Guy–What Kind of a Guy Was He? Right. So here’s where things can get a little hairy. The latter opinion I read in an essay in a collection of Jewish responses to missionaries, and I found it rather harsh. I tend to lean towards the liberal side, but… again, I don’t really spend a lot of time and effort thinking about this. I don’t actually care what kind of a guy he was. He’s not relevant to my life. I really believe that most people who ask this question are genuinely curious and have the best of intentions. I’m even willing to forgive the gentle missionizing I’ve gotten here or there–“You really should read the New Testament, I think it will be very meaningful for you” type things. I know this comes from a genuine concern for my soul, as according to traditional Christian theology, I’m going to end up in Hell for all eternity after I die for believing all the things stated above. They don’t want that to happen to me. I really do appreciate the concern. Let’s be frank: it was not so very long ago that Christians were burning us at the stake “out of concern for our souls.” Like, yes, I do believe many of them were genuinely concerned and acting out of what they thought was kindness, but… my appreciation has limits, mmkay? In medieval Europe Jews were forced to sit in our own synagogues and listen to preachers lecturing about Jesus and salvation as part of a general strategy to get Jews to convert. Those days are over. If anyone, however well-meaning, starts aggressively proselytizing me, I am going to walk away. Because it’s the 21st century and I can do that now without getting my throat slit. Therefore, if I just met someone, and they ask me what I think about Jesus, I will be on edge. I never know what their next question or statement is going to be. It’s not at all unlikely that it will contain some subtle or not-so-subtle attempt at soul-saving. And that’s gonna be awkward for everybody. Speaking of which, a note to our readers: any comments to that effect will be deleted. You’re not going to change my mind about Jesus. Ever. Don’t waste your time. This group claims to be Jews who merely accept Jesus as the Messiah. They use Jewish lingo, Jewish symbolism, and Jewish rituals. But in practice, these people are not Jews, they are Christians. Many of them are not ethnically or halakhically Jewish and have no religious Jewish background. They claim outwardly to believe only that Jesus was the Messiah, but their beliefs about him are actually consistent with Christianity. They are aggressive missionizers and prey on lonely Jews with little knowledge. I know a few people who got involved with them and had a very difficult time getting out. It may surprise you to hear me speak so harshly about a religious group. While I may have my disagreements with Christians, Muslims, Hindus, et al, I don’t have a problem with people who practice their faiths in earnest. But you know me; if there’s one thing I have zero tolerance for, it’s dishonesty. These people claim to be a stream of Judaism. They are not. They are, at best, a group of people who think they are following Judaism but are actually Christians. At worst, they are a deceitful stream of Christianity that is trying to save Jewish souls by pretending that Christianity and Judaism are not mutually exclusive. I am not cool with that. What I am cool with, is Christians celebrating their own faith and traditions. So on that note, a blessed Holy Week to you and all who celebrate, and Chag Sameach to all our Jewish readers! So, I have to admit this is one of the post I actually enjoyed most! Not that the others are not as good as this one. But because it touches something I cannot explain, but that is deep within me. Maybe is the fact that I have never asked you that questions (why should any Christian ask it – I do not understand it). Maybe is the fact that probably you are pointing out one of the things I most admire form you: That you do not value faith over people and it helps you talk to everyone, even if they want to hurt you. Maybe is the fact that I do not believe in the Original Sin – why should I? The God I believe in is ALL about Love and Compassion. Anyway – love from Barcelona! Answered you off-blog. 😉 Love from the Judean Hills!